Improved curriculum linkages – XOs put into the context of the thematic (rich task) PNG primary school curriculum and lesson planning system. 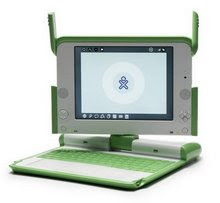 Local support improved - BU confirming Simon Nimyon to be appointed Education Officer for Oksapmin with OLPC support role, and Catholic Education Authority announcing appointment of a Horizon 3000 volunteer with OLPC support role, and Kevin Joseph in his OLPC technical support role in N Fly. Infrastructure checked and all systems updated and working, with roles set in Moodle (Kevin and Simon were trained to do basic Moodle roles administration). Simon trained to install the network switches at Tominiap and Mitikinap and enable multiple access points. An evaluation of the Kiunga workshop by participants (page 30) revealed that all participants who responded agreed or strongly agreed that the intended outcomes of the workshop were achieved. The weakest area (9/13 responding “somewhat agree”) was in regard to being equipped with strategies to manage the deployment. Thus, that is where the local support is most needed. On the last day, Yenkenai village was hit by lightning. Unfortunately it also hit the school and ran down the outdoor access point to burn out the server. Only the solar panel was found to be working. It is possible to move some eqt from Matkomnae to Yenkenai without affecting performance with their current number of laptops; thus only the server and the cables and power injector need replacing. Finalbin school is using a PC as a school server. This is OK and may last for a good time, but it is advisable to replace with the dedicated small servers which are better able to run 24/7. At Tekin a replacement inverter was supplied. However, before the system can be moved to the High School office where the solar panels are mounted, a network cable needs to be routed from PS office. It was discovered that the sealed batteries that the Mt Hagen solar power company has been supplying, are in fact car batteries and unsuitable for deep cycle work. They may be OK if they are used only for the servers and access points, in which case a very low cycle depth will result. As they have extra batteries, three in parallel will further reduce cycle depth. However, they cannot be expected to last for a very long time. One overall outcome of the series of training workshops is improved consensus on the priorities and strategies for a more sustainable continuing OLPC programme. The participants met and shared their views and developed some shared thinking on the way forward. Five strategy areas were identified and some practicable tasks or aims were listed. These are shown below, in a table with measurable outputs that the resource persons can try to achieve (Kevin Joseph in North Fly, Simon Nimyon in Oksapin and Steven Tela in Kisap). Important recommendation: A pilot project needs at some stage to be evaluated. In order for partners (such SMIT) to assess the pilot and make decisions on any extended roll out, an evaluation framework should be drawn up and then the project monitored over a period of time and lessons learned (i.e. a formative evaluation). The Solomon Islands evaluation framework (see the ACER evaluation report)is an example but we can be more or less ambitious. This needs to be agreed on by the education partners.